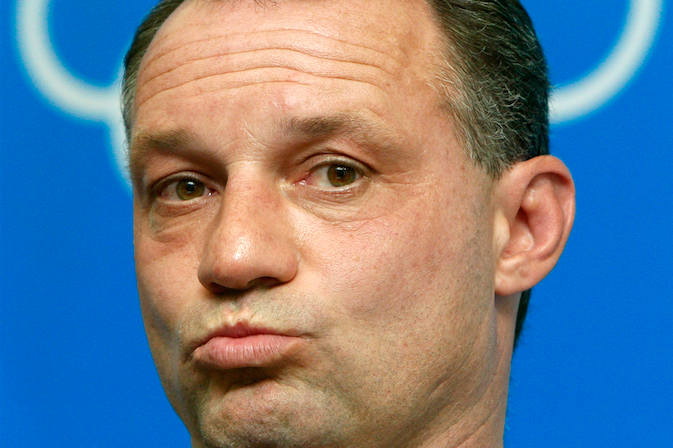 Peter Nowak from Poland, coach of the US men soccer team, attends a press conference at the Beijing 2008 Olympics in Tianjin, Tuesday, Aug. 5, 2008. The US will play in Group B against Nigeria, The Netherlands and Japan. Former Philadelphia Union soccer coach Peter Nowak, who sued the MLS team after he was fired in 2012 amid hazing allegations and a poor record, allegedly spanked his players on a regular basis, dismissed protocols for handling concussions and forced players to run up to 10 miles in the heat without water, according to newly released court documents. In his previous legal challenge, Nowak argued the team did not consult him about the hazing issues, failed to provide a written disciplinary record and never allowed him to rectify the situation, violating the terms of a contract that would have compensated him through 2015. An arbitrator upheld Nowak's dismissal in April, ordering him to pay the Union $400,000, but in filings recently submitted as part of a new challenge, Nowak described in detail some of the degrading and dangerous tactics he employed as the Union coach, Sports Illustrated reports. "His description of what he did was quite unnerving, especially when he described how he put his hand in a bucket of ice water to ease his pain, obviously because he was hitting the young people so hard," arbitrator Margaret Brogan said in April. "The hazing of rookies, by spanking them, sometimes with a sandal, was completely unacceptable." According to the new court documents, Nowak directed his ire primarily at rookie players, referring to his spanking discipline as "paddling" and revealing that videos of the incidents were taken by assistant coaches between 2010-2012. Other details to emerge include Nowak's requirement that rookies run 10 miles without water in 80-degree weather and his alleged harassment of players who suffered from concussion symptoms. Lawyers for the Union contend that Nowak "created an environment where players felt the need to hide or mask concussions," even outright denying their existence. Despite awareness of the hazing allegations throughout the clubhouse, Nowak's lawyer claims the Union took no immediate action to stop the ritual and may have tacitly condoned it. Nowak, 51, was formerly a star soccer player in Europe and served as captain on the Polish national team for several years during the 1990s. In 75 games as coach of the Union, he went 21-30 with 24 draws before his dismissal during a 2-7-2 start to the 2012 season. In this week's legal memorandum, Nowak's lawyer claims the team fired him as a pretext to get out of his client's contract and that the arbitrator displayed bias in upholding the dismissal.